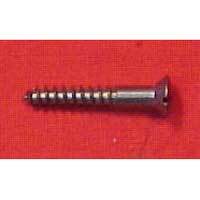 Special, un-plated, steel screws for the gun builder or craftsman who wants to brown or antique the screws used in his project. Achieve a faster, more uniform brown than with plated screws. Oval head available in four sizes. Pack of 12 screws. Available in 3 x 3/8" No. 57S13, 5 x 5/8" No. 57S14, 8 x 1" No. 57S15, 10 x 1-1/4 No. 57S16.